Tom Kuryla (19) of the Notre Dame Fairfield Lancers shoots and scores a first period goal during a game against the Simsbury Trojans on Wednesday January 16, 2019 at The Rinks in Shelton, Connecticut. 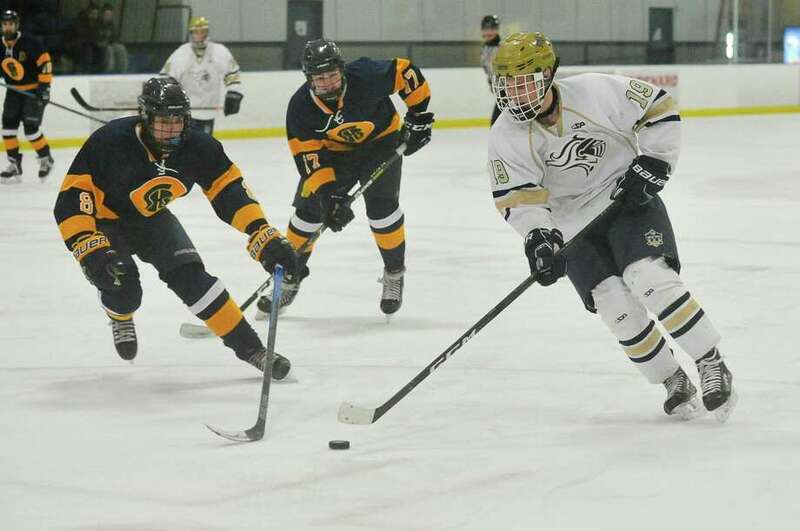 SHELTON — Nate Stiles scored two goals and had one assist to lead ND-Fairfield in a 5-4 overtime win over Simsbury in a non-league boys hockey game Wednesday afternoon at The Rinks at Shelton. Thomas Kuryla and Kevin Barrett each added one goal and one assist and Kacy Adams made 24 saves in goal in the win for the Lancers (4-7), while Cole Chapman had three goals and one assist in the loss for the Trojans (3-6-1). Records: Simsbury 3-6-1, ND-Fairfield 4-7. Goals: S—Cole Chapman 3, Jack Fiengo; NDF—Nate Stiles 2, Thomas Kuryla, Brian Essing, Kevin Barrett. Assists: S—Scott Simeon 2, Rocco Cirilli 2, Chapman; NDF—Barrett, Stiles, Kuryla, Jeremy Goulden, Justin LaSella, Matt Ward. Goalies: S—Justin Loveland (23 saves); NDF—Kacy Adams (24). Shots: S—28; NDF—28. Goals: Xavier – Tom Lynch; NDWH – Ian Hayden; John D’Errico; Assists: NDWH – Rory Andriole 2, Hayden 1, D’Errico 1; Shots: X – 27; ND 23; Saves: Xavier – Beauton 21; NDWH – Smith 26. Records: St. Joseph 0-10, Darien 5-4. Goals: D—Teddy Dyer 3, Sean Bradley, Matthew Daileader, Griffen Martens, Samuel Erickson, Blake Swiggett, Daniel Lowe. Assists: D—Jamison Moore 2, Daileader 2, Brian Zaffino, James Conway, Lowe, Matthew Fiorita, Matthew Stein, Bennett McDermott, Martens. Goalies: SJ—Tyler Swiggett (18 saves), Chris Higgins (18); D—Chris Schofield (10). Shots: D—45; SJ—10. Demeri Carangelo tied the game at 5 at 13:25 of the third period to send the game into overtime and then scored the game-winning goal at 3:01 of overtime to lead the Hamden girls hockey team to a 6-5 win over Northwest Catholic/Mercy on Wednesday. Carangelo ended up with five goals and an assist for the Green Dragons (6-5). Skylar Kline had a hat trick to lead Northwest Catholic/Mercy. First Period: — Skylar Kline 0:46; — Skylar Kline (from Annie Alissi 8:17; — Demeri Carangelo (from Claire Boncek 10:14; Second Period: — Andi Chancio (from Megan Sisk 8:56; — Demeri Carangelo (from Reilly Sargolini 12:27; Third Period: — Kaylie Zemke (from Riley Esposito and Riley Millard) 9:48; — Demeri Carangelo (from Claire Boncek 11:11; — Skylar Kline 11:43; — Ari Martin (from Demeri Carangelo 13:01; — Demeri Carangelo (from Reilly Sargolini 13:25; Overtime: — Reilly Sargolini (from Gabby Mignosa 3:01. Gawayne Fisher had 18 points and Jean Leukau added 17 to lead Naugatuck to its NVL win in Ansonia. Avery Hinnant added 14 points for Naugatuck (6-4). Glenn Hines led the Chargers (5-5) with 19 points and Martin Antoine added 15. Martin Antoine 5 0 2-2 15, Glenn Hines 8 0 1-1 19, Alfonso Smith 5 0 0-0 14, Seth Roselle 1 0 0-0 2, Sheldon Schuler 2 0 4-4 8, Devonte Weaver 3 0 0-0 6 Totals: 24 7 64. Derrick Jagello 3 0 0-0 9, Gawayne Fisher 8 0 2-2 18, Jean Lukau 7 0 1-1 17, Avery Hinnant 7 0 0-0 14, Jay Bartin 1 0 0-0 3, Andrew Roberson 1 0 1-1 4, Ese Onakpoma 0 0 1-1 1. Totals: 27 5 66. 3-pointers: N—Jagello 3, Leukau 2, Roberson, Barth; A—Smith 4, Antonie 3, Hines 2. Terrance Edwards finished with 19 points for Wilbur Cross in an SCC win at New Haven. Kyle Daniels added 13 points for the Governors (5-4). Colin Kellaher had a game-high 20 points for Guilford. Stuart Vargas had 13 points and Jamesyn Brothers added 12 points and eight steals to lead the Condors to their CTC win in Ansonia. Elijah Moore added eight steals and six points for the Condors (3-5). Stephen Thomas led Vinal Tech (0-9) with 19 points. Jamesyn Brothers 3 0 4-5 12, Stuart Vargas 5 0 0-0 13, Nashua Colon 2 0 0-2 4, Elijah Moore 3 0 0-0 6, Marques James 0 0 0-2 0, Xavier Gonzalez 11 0 2-6 22, Zach Rodriguez 0 0 2-2 2, Newkirk 2 0 0-0 4, Ozzy Priar 1 0 0-0 3 Totals: 27 8-17 66. Steven Thomas 7 0 5-6 10, Jaquan Fountain 0 0 1-2 1, Franco Sorrentino 6 0 0-0 13, Will Trojanowski 5 0 3-4 16, Nate Figueroa 0 0 1-2 1, Mason Rosa 1 0 1-2 4. Totals: 19 11-16 54. 3-pointers: VT—Trojanowski 3, Sorrentino, Rosa; OT—Vargas 3, Brothers 2, Priar. Highlights: OT—Brothers had eight assists. Moore had eight steals. Nicholas Wheeler 3 0-3 6 Charles Flowers 5 4-5 14 Cayden Mitchell 3 0-0 7 Hunter Keller 1 1-2 3 Tanner Sorracco 2 2-2 6 Patrick Mucherino 2 3-4 7. Totals: 16 10-16 43. Max Gayle 7 3-3 17 Dion Perkins 9 9-11 27 DJ Miller 1 0-0 2 Daniel Manente 4 0-0 8 Markel McKnight 0 1-2 1 Matt Oczkowski 2 0-0 5 Dhruv Kapadia 0 0-0 0 Luke Venier 2 0-0 5 Joe Orlando 0 2-2 2 Kevin Harmeling 0 0-0 0 Chris Seara 0 0-0 0 Kyle Harmeling 2 1-2 6 James Riley 0 0-0 0 Alex Okula 0 0-0 0. Totals: 24 16-20 73. 3-pointers: O—Mitchell; S—Oczkowski, Ky. Harmeling, Venier. Highlights: S—Perkins had 10 rebounds and five steals. Gayle had nine rebounds. Kevin Crawford 5 1-2 11 Giovanni Santiago 1 0-0 3 Deandre Morgan 1 0-0 2 Julio De Los Santos 4 0-0 12 Javier Hernandez 1 0-0 2 Emery Linton 5 2-2 12 Jason Marrero 3 0-1 6 Jordan Gallimore 8 4-6 23 Ricky Irby 2 0-1 4 Sincere Sullivan 2 0-0 5. Totals: 31 7-12 77. Jaylin Palmer 1 7-10 9 Jorelle Jernigan 0 2-2 2 Anthony Douglas 1 0-0 2 Raquan Tompkins 5 0-0 10 Mark McCalop 1 0-0 2 Jefferson 0 1-2 1 Quinton Haughton 3 1-2 7 Jaidan Gilzene 5 1-2 11 DeAndree Kelly 3 1-3 7 Owens 1 0-2 2. Totals: 24 11-22 53. 3-pointers: B—De Los Santos 4, Santiago, Sullivan. Highlights: B—Crawford had six steals. Gallimore and Sullivan each had 10 rebounds. Linton had eight assists. Cape Holden 4 2-2 11 Blake Macklin 3 0-0 6 Rodney Medor 4 1-1 11 Max Mitchell 1 3-4 5 Chase Johnson 3 0-0 9 Phil Conner 5 5-8 15. Totals: 20 11-15 57. Khalid Moreland 8 2-6 18 Max Edwards 5 4-4 15 Elijah Alexandre 7 0-3 15 Jaden McDowell 1 0-0 3 Derrick Gyimah 1 0-0 2 Josh Giannoni 2 1-2 5 Javon Wilson 1 0-0 2 Tiyorne Coleman 1 2-2 4. Totals: 26 9-17 64. 3-pointers: NDF—Johnson 4, Medor 2, Holden; B—Edwards, Alexandre, McDowell. Highlights: NDF—Medor and Mitchell each had six rebounds. Conner had 16 rebounds and eight assists. Kolby Sirowich had 15 points and 12 rebounds Morgan Teodosio added 12 points and 12 rebounds to lead the Wildcats (9-3) to their NVL win. Sydnie Drezek added 11 points for Seymour. Molly Sastram led the Wolverines (6-6) with 10 points. Kolby Sirowich 4 6 15 Alyssa Cosciello 0 0 0 Megan Condo 2 0 4 Sydnie Drezek 3 5 11 Morgan Teodosio 6 0 12 Caty Ragaini 1 0 2 Jacey Cosciello 0 0 0 Izzy Calabro 0 0 0 Arlinda Peraj 0 0 0 Kiley Drezek 1 0 2. Totals: 17 11 46. Kelly Shpak 2 1 7 Molly Sastram 3 4 10 Molly Smith 4 0 8 Paige Davis 0 0 0 Maddie Smith 2 2 6 Maddie Sastram 0 0 0. Totals: 11 7 31. Highlights: S—Teodosio and Sirowich each had 12 rebounds. Amanda Zdru 7 0-3 14 Jasmine St. Clair 1 0-2 2 Alyssa Wright 1 0-0 2 Brianna Ramos 5 0-0 10 Maura Kelly 1 3-4 5 Yvemalya Germain 1 0-0 2 Kristin Zack 0 2-2 2 Toni Greene 2 0-0 5. Totals: 16 5-11 42. Ciara Brown 3 8-10 14 Yamani McCullough 6 6-9 20 Erin Harris 2 0-0 4 Aizhanique Mayo 4 0-0 11 Laryssa Guimaraes 1 0-0 2 Mia Dunn 1 0-0 2 Krystalee Fernandez 1 2-2 5. Totals: 18 16-21 58. 3-pointers: B—Greene; NDF—Mayo 3, McCullough 2, Fernandez. Arman 0 0-0 0 Tucker 0 0-0 0 Ki. Jenkins 8 4-7 22 Chamberlin 0 0-0 0 Marcus 2 1-2 5 Najork 0 0-0 0 Kh. Jenkins 1 0-0 2 Apollon 5 2-2 15. Totals: 16 7-11 44. MaryGrace DelliSanti 0 0-0 0 Menna Delva 0 0-0 0 Georgia Grabowski 7 4-7 20 Elyse Kimball 0 0-0 0 Katherine Marcus 6 8-9 23 Caroline McCall 1 0-1 2 Lilah McCormick 0 0-0 0 Kristiana Modzelewski 3 0-0 7 Sarah Peltier 2 0-0 4 Kelly Van Hoesen 1 0-0 2. Totals: 20 12-17 58. 3-pointers: M—Apollon 3, Ki. Jenkins 2; GFA—Marcus 3, Grabowski 2, Modzelewski. Highlights: GFA—Grabowski had five rebounds, one assist and one steal. Marcus had 11 rebounds, three steals and two assists. Modzelewski had seven rebounds and one assist. Gabby Mastopietro 5 1-5 11 Kylie Bolonski 3 1-2 7 Hana Bojka 5 2-4 12 Andra Bojka 1 1-4 4 Ava Delucia 0 0-0 0 Riley Kane 1 2-4 4 Jillian Barberito 2 2-4 7. Totals: 17 9-23 45. Cristina Carloni 2 1-2 5 Madison Koval 5 9-12 19 Kiara Swilling 3 0-0 6 Devina Lopez 0 0-2 0 Isabelle Chevarella 1 5-8 7 Lucy Lane 4 0-0 11 Emily Borowski 0 0-0 0 Precious Perez 0 0-0 0 Taylor Seno 0 0-0 0 Laney O’Hara 0 0-0 0. Totals: 15 15-24 48. 3-pointers: W—A. Bojka, Barbarito; D—Lane 3. (at Milford): 106 pounds: Sam Stein (H) def. Anthony Giordano, 17-6; 113: Zach Morro (H) def. Tanish Joshi, 6-5; 120: Kyle Davern (H) pinned Kyle Pokornowski, 1:55; 126: Jordan Lang (F) pinned Sean Portley, 1:37; 132: Jared Puricelli (H) pinned Mike Melillo, 2:35; 138: Connor Shallis (F) pinned Cam Chieppo, 1:40; 145: Ethan Edmundson (F) pinned Blake McGee, 3:37; 152: Sam Williams (H) pinned Eric Hallstrom, 1:47; 160: K.J. Pokornowski (F) def. Carter Ganino, 3-2; 170: Umer Kahn (F) def, Seamus Moriarty, 7-1; 182: Patrick Brogan (F) pinned Ian Hurley, 3:22; 195: Nolan Bannon (F) pinned Alec Dube, 3:43; 220: Billy Ives (F) pinned Matt Derken, 2:10; 285: Patrick Rescsanski (F) won by forfeit. Records: Foran 24-2. Hand 10-4. 106 Dominic Milano (East Haven) F Ian Connelly Fairfield, CT (Fairfield Prep); 120 Mathew Divito (East Haven) TF Pj Rogers (Fairfield Prep), 19-4; 126 Henry Bosken (Fairfield Prep) F Hugo Ortiz (East Haven), 3:59; 132 Alec Divito (East Haven) F Michael Ramirez (Fairfield Prep), 1:30; 145 Albert Doheny (East Haven) F Patrick Tiernan (Fairfield Prep), 2:37; 152 Sean Zentner (Fairfield Prep) DEC Fabricio Bugatti (East Haven), 7-3; 160 Dean Tsiranides (Fairfield Prep) F Jak. (at Wilton): 113: Maximus Mannino (W) maj. dec. Jack Cahill 11-3; 120: Michael Campos (N) won by forfeit; 126: Sam White (N) pinned Michael Arbisi 55 seconds; 132: Chase Larkin (N) won by forfeit; 138: Cesar Rivera (N) won by forfeit; 145: Michael Boyian (N) won by forfeit; 152: Connor Gilchrist (N) won by forfeit; 160: Mykol Reyes (N) won by forfeit; 170: Chris Muralles (N) won by forfeit; 182: Anthony Marini (N) won by forfeit; 195: Roman Pychil (N) won by forfeit; 220: Griffin Morris (W) won by forfeit; 285: Jack Ferguson (W) pinned Tom Jakaj 2:57. (at Trumbull): 106: Michael Longo (T) dec. Kai Odell 5-4; 113: Travis Longo (T) pinned Liam Knight 48 seconds; 120: Jack Ryan (T) dec. Tyler Johnson 5-2; 126: Ryan Jack (D) pinned Jonathan Kosak 4:17; 132: Kyle Fields (D) pinned Sean Capalbo 35 seconds; 138: Matt Ryan (T) tech. fall Logan Kovacs 17-1; 145: Ben Leblanc (D) dec. William Holmes 10-3; 152: Jaylen Hawkins (D) maj. dec. George Bomann 12-2; 160: Tyrell Jones (D) pinned Ben Cousins 2:59; 170: Jesse Patton (D) pinned Jason Mercado 4:31; 182: Joseph Palmieri (T) pinned Billy Rojas 3:43; 195: Montez Osbey (D) pinned Robert DeJesus 1:01; 220: DJ Donovan (D) pinned Mitchell Russo 23 seconds; 285: Jordan Agosto (D) pinned Matthew Ryan 1:29. Also: At 106 pounds, Trumbull’s Michael Longo won by an 8-1 decision over Abbott Tech’s Jake Defonce. (at Barlow): 106: Joshua Brault (B) pinned Evan Cavicchia 53 seconds; 113: Charlie Prather (B) dec. Jack Tunney 5-0; 120: Walter Alvarez (B) pinned Brayan Sanchez 2:10; 126: Noah Simons (B) pinned Nicholas Fontana 2:55; 132: Christopher Wilson (W) won by forfeit; 138: Tony Fontana (W) won by forfeit; 145: Breon Phifer (W) pinned Keyner Rojas 1:02; 152: Alex Klein Wassink (B) pinned Nouri Sayegh 3:52; 160: Cole Sylvia (B) pinned Andrew Prackup 5:01; 170: Frankie McNeary (B) pinned Declan Miles 27 seconds; 182: Carson LiCastri (B) pinned Alec McGlone 1:51; 195: Joseph McGuire (W) pinned Erik Areklett 1:01; 220: Daniel McGuire (W) pinned Ben Bai 5:29; 285: Anthony Martinez (B) dec. Charles Gallardo 4-3. (at Warde): 106: Duane Capozziello (W) dec. Jack Goetz 8-3; 113: Dylan Cruvivel (W) won by forfeit; 120: Keenan Yu (W) pinned Joey Bucci 3:39; 126: Will Ebert (W) won by forfeit; 132: Jeremy Brault (W) won by forfeit; 138: Dennis Toslluku (W) won by forfeit; 145: Tyler Sung (NC) pinned Edgar Moreno 40 seconds; 152: Noah Zuckerman (W) pinned Nate Sibbett 4:45; 160: Christian Sibbett (NC) dec. Matt Sullivan 6-0; 170: Hunter Rasmussen (W) won by forfeit; 182: John Summers (W) won by forfeit; 195: Griffin Gallati (W) won by forfeit; 220: Joe Gjinaj (W) won by forfeit; 285: Teddy DeClue (NC) dec. Alec Nardone 6-1. (at Ludlowe): 106: Michael Hwang (L) won by forfeit; 113: Jacob Pressler (L) pinned Thomas Kiernan 51 seconds; 120: Yuri Case (L) won by forfeit; 126: Antonio Nicholas (L) won by forfeit; 132: Chris Muschette (L) won by forfeit; 138: Sean Zimmerman (L) pinned Scott Dansker 5:15; 145: Ben Zhao (L) won by forfeit; 152: Eric Emmendorfer (L) pinned Ethan Schrader 1:22; 160: Justin Hathaway (L) won by forfeit; 170: Thomas Murray (L) pinned Nick Ricci 26 seconds; 182: Stan Godlewski (L) pinned James Nedder 3:54; 195: Alex Bueno (L) won by forfeit; 220: Rhys Overbeck (D) won by forfeit; 285: Daniel Fitzpatrick (D) won by forfeit. Records: Ludlowe 10-4. (at Law): vault: 1. (tie) Emma Nelly (L) and Alaina Karp (P) 8.5; 2. Kylee Troy (L) 8.4; 3. Paige Brandt (N) 8.3; bars: 1. Karp (P) 7.5; 2. (tie) Lizzy Lombardi (L) and Nelly (L) 7.3; 3. Meghan Smith (P) 7.2; beam: 1. Karp (P) 9.0; 2. Annabelle Montero (N) 8.4; 3. Nelly (L) 8.3; floor: 1. Karp (P) 8.8; 2. (tie) Nelly (L) and Brandt (N) 8.3; 3. (tie) Makenna Sharpe (L) and Montero (N) 8.1; all-around: 1. Karp (P) 33.8; 2. Nelly (L) 32.4; 3. Sharpe (L) 30.8. Records: Law 7-1. (at Masuk): 200 medley relay: Masuk (Will Briand, James O’Shaughnessy, Mike Aiello, Matthew Hull) 1:45.51; 200 freestyle: Joey Nizzardo (M) 1:50.21; 200 IM: Mason Suba (N) 2:06.49; 50 freestyle: Colby Delia (N) 22.61; 100 butterfly: Aiello (M) 55.22; 100 freestyle: Suba (N) 50.46; 500 freestyle: Nizzardo (M) 4:53.83; 200 freestyle relay: Newtown (Delia, Suba, Xavier Williams, Matt Irving) 1:33.14; 100 backstroke: Michael Annesley (N) 58.98; 100 breaststroke: Delia (N) 1:04.27; 400 freestyle relay: Newtown (Suba, Sean McCleary, Williams, Irving) 3:32.42. Records: Masuk 5-0, Newtown 2-2.